Col. Sani Kukasheka Usman, Abuja: Today, Tuesday 28th June 2016, troops of 121 Task Force Battalion, 26 Task Force Brigade, accompanied by a large number of Civilian JTF from Gwoza, embarked on a very aggressive patrol that dislodged remnants Boko Haram terrorists hibernating at Ngoshe and Gava villages, located close to Gwoza on the mountainous terrain. The essence of the robust patrol which was supported by the Nigeria Air Force and Cameroonian Defence Forces who provided air cover and real time Intelligence Surveillance and Reconnaissance, was to clear the remnants of the terrorists hiding in the mountainous area and rescue all persons held hostages by the Boko Haram terrorists. 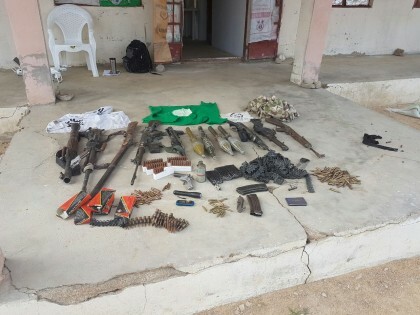 While advancing towards their objective in Ngoshe, the patrol team encountered Boko Haram terrorists. They have to clear the delay positions staged by the terrorists through the support of the Nigeria Air Force fighter jets. Although the number of terrorists killed could not be ascertained, quite a number of them where seen falling over the mountains when engaged. It is equally believed several others escaped with gun shot wounds. The troops were however able to recover quite a number of arms and ammunitions. These include; 1 Rocket Propelled Grenade (RPG) tube, 4 RPG Bombs, 1 General Purpose Machine Gun (GPMG), 1 Fabrique Nationale (FN) rifle and 3 AK-47 rifles. Other items recovered include 1 Sub-Machine Gun(SMG), 1 Locally made Pistol, a locally made Double-Barrel gun, 1 Smoke Grenade, 243 rounds of 7.62mm (NATO) ammunition and 1 round of 7.62mm (Special) ammunition. They also recovered 18 rounds of MI16 rifle, 3 G3 Rifle magazines, 2 AK-47 magazines, 1 mobile telephone handset and a SIM card, as well as a pair of military desert camouflage uniform. Other items were an address card, 3 Boko Haram terrorists flags and a Toyota Hilux vehicle painted in desert camouflage colour and motorcycles. The troops did not find any hostage in Gava. However, they rescued 16 civilians held in Ngoshe prison, while many residents of the town saw it as an opportunity to flee from the town. Both the rescued and freed persons are being profiled by the troops.